Battlegrounds received positive reviews from critics, who found that while the game had some technical flaws, it presented new types of gameplay that could be easily approached by players of any skill level and was highly replayable. The game was attributed to popularizing the battle royale genre, with a number of unofficial Chinese clones also being produced following its success. The game also received several Game of the Year nominations, among other accolades. PUBG Corporation has run several small tournaments and introduced in-game tools to help with broadcasting the game to spectators, as they wish for it to become a popular esport. The game's concept and design was lead by Brendan Greene, better known by his online handle PlayerUnknown, who had previously created the ARMA 2 mod DayZ: Battle Royale, an offshoot of popular mod DayZ, and inspired by the 2000 Japanese film Battle Royale. At the time he created DayZ: Battle Royale, around 2013, Irish-born Greene had been living in Brazil for a few years as a photographer, graphic designer, and web designer, and played video games such as Delta Force: Black Hawk Down and America's Army. The DayZ mod caught his interest, both as a realistic military simulation and its open-ended gameplay, and started playing around with a custom server, learning programming as he went along. 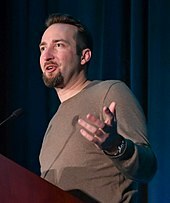 Greene found most multiplayer first-person shooters too repetitive, considering maps small and easy to memorize. He wanted to create something with more random aspects so that players would not know what to expect, creating a high degree of replayability; this was done by creating vastly larger maps that could not be easily memorized, and using random item placement across it. Greene was also inspired by an online competition for DayZ called Survivor GameZ, which featured a number of Twitch.tv and YouTube streamers fighting until only a few were left; as he was not a streamer himself, Greene wanted to create a similar game mode that anyone could play. His initial efforts on this mod were more inspired by The Hunger Games novels, where players would try to vie for stockpiles of weapons at a central location, but moved away from this partially to give players a better chance at survival by spreading weapons around, and also to avoid copyright issues with the novels. In taking inspiration from the Battle Royale film, Greene had wanted to use square safe areas, but his inexperience in coding led him to use circular safe areas instead, which persisted to Battlegrounds. In March 2019, Battlegrounds was banned in the Indian state of Gujarat after the local government decided the game was "too addicting and violent" and an unnecessary distraction during exam season. A number of students caught playing the game were arrested as a result. The ban was not renewed in some cities in the state after March as exam season had ended. A similar ban was enacted in Nepal in April 2019, with the Nepal Telecommunications Authority stating that the game was addictive to children and teenagers. ^ Forward, Jordan. "PUBG new map – all the latest details on the upcoming snow map, Vikendi". PCGames. Retrieved March 2, 2019. ^ Byford, Sam (August 8, 2018). "PUBG developer admits PUBG is broken with 'Fix PUBG' campaign". The Verge. Retrieved August 8, 2018. ^ Castello, Jay (November 18, 2018). "Playerunknown's Battlegrounds declares FIX PUBG a success, talk new development directions". Rock, Paper, Shotgun. Retrieved November 18, 2018. ^ Yin-Poole, Wesley (March 13, 2019). "Brendan "PlayerUnknown" Greene moves on from PUBG". Eurogamer. Retrieved March 13, 2019. ^ Batchelor, James (April 1, 2019). "Brendan Greene: "I'm done with battle royale"". GamesIndustry.biz. Retrieved April 1, 2019. ^ Kerr, Chris (May 4, 2018). "Battlegrounds item trading shut down due to marketplace abuse". Gamasutra. Retrieved May 4, 2018. ^ Castello, Jay (October 6, 2018). "Playerunknown's Battlegrounds has banned over 13 million cheaters". Rock, Paper, Shotgun. Retrieved November 18, 2018. ^ Jones, Ali (October 4, 2018). "After months asking for region locks, PUBG players are mad about region locks". PCGamesN. Retrieved October 21, 2018. ^ Grubb, Jeff (August 21, 2018). "PlayerUnknown's Battlegrounds leaves Xbox Game Preview on September 4". VentureBeat. Retrieved August 21, 2018. ^ Kzenevic, Kevin (September 4, 2018). "PUBG Launches On Xbox One, Adds Sanhok Map And More In 1.0 Update". GameSpot. Retrieved September 4, 2018. ^ Goslin, Austin (November 13, 2018). "PlayerUnknown's Battlegrounds coming to PS4 in December". Polygon. Retrieved November 13, 2018. ^ Yin-Poole, Wesley (November 13, 2018). "PUBG hits PS4 with Nathan Drake and Ellie items". Eurogamer. Retrieved November 14, 2018. ^ Bankhurst, Adam (November 6, 2018). "Here's A Brand New Pubg Short Film By Metal Gear Solid Movie Director Jordan Vogt-roberts". IGN. Retrieved November 6, 2018. ^ Saed, Sherif (January 25, 2019). "PUBG Lite is a free-to-play version for low-spec PCs, limited to Thailand for now". VG247. Retrieved January 25, 2019. ^ a b "PlayerUnknown's Battlegrounds for PC Reviews". Metacritic. CBS Interactive. Retrieved March 21, 2018. ^ "PlayerUnknown's Battlegrounds for PlayStation 4 Reviews". Metacritic. CBS Interactive. Retrieved January 11, 2019. ^ "PlayerUnknown's Battlegrounds for Xbox One Reviews". Metacritic. CBS Interactive. Retrieved January 11, 2019. ^ "PlayerUnknown's Battlegrounds Mobile for iPhone/iPad Reviews". Metacritic. CBS Interactive. Retrieved June 25, 2018. ^ Nakamura, Yuji; Kim, Sam (May 29, 2018). "Most Popular Game on the Planet Accused of Copyright Violation". Bloomberg L.P. Retrieved May 29, 2018. ^ Kim, Sam (June 26, 2018). "Copyright Lawsuit Dropped Against Fortnite Creators, Ending Legal Battle". Bloomberg L.P. Retrieved June 27, 2018. ^ Valentine, Rebekah (March 25, 2019). "PUBG Corp, NetEase settle copyright lawsuit". GamesIndsutry.biz. Retrieved March 25, 2019. ^ a b Mukherjee, Amritanshu. "PUBG ban lifted from Ahmedabad, police still worried about side effects of the game". India Today. Retrieved 12 April 2019. ^ "PUBG Mobile Ban: You Will Get Arrested For Playing The Battle Royal Game in These Cities in India". News18. Retrieved March 15, 2019. ^ Liao, Shannon (March 14, 2019). "Police in India arrested ten students for playing PUBG". The Verge. Retrieved March 15, 2019. ^ Sharma, Gopal (April 11, 2019). "Nepal bans online game PUBG citing negative impact on children". Reuters. Retrieved April 11, 2019. ^ McWhertor, Michael (June 19, 2018). "PUBG reaches 50M copies sold, 400M total players". Polygon. Retrieved June 19, 2018. ^ LeFebvre, Rob. "'PUBG' mobile app surpasses 100 million downloads". Engadget. Retrieved August 17, 2018. ^ a b "PUBG Mobile hits $100 million slower than Fortnite because of China". VentureBeat. October 24, 2018. ^ Lao, Shannon (December 18, 2018). "PUBG mobile has as many players as Fortnite". The Verge. Retrieved December 19, 2018. ^ Jones, Ali (December 19, 2018). "PUBG Mobile has as many players as Fortnite". PCGamesN. Retrieved December 19, 2018. ^ "Charted: India's obsession with Chinese online game PUBG". Quartz. December 10, 2018. ^ Romano, Sal (January 23, 2019). "Media Create Sales: 1/14/19 – 1/20/19". Gematsu. Retrieved February 12, 2019. ^ Watts, Steve (July 2, 2018). "Resident Evil 2 Wins E3 Game Critics Awards' Top Honor". GameSpot. Retrieved July 3, 2018.